One thing I love about Boogie Nights is how it’s so different, but so distinctly a Paul Thomas Anderson movie. I’ve seen every of his features, and there’s something so specific about his filmmaking, without being distracting. I don’t think you watch Boogie Nights constantly reminded that he directed it, but it’s still there. 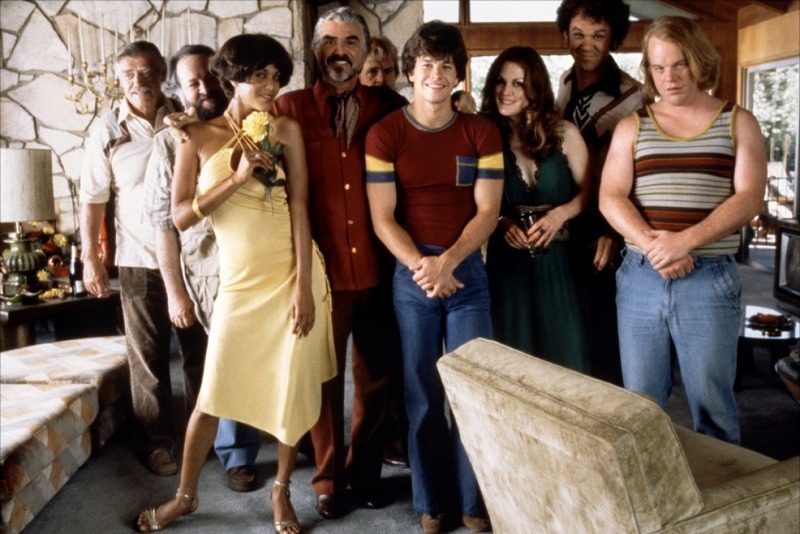 But yeah, like so many of Anderson’s movies, Boogie Nights’s cast is almost unreal. Mark Wahlberg, Julianne Moore, Burt Reynolds, Don Cheadle, John C. Reilly, William H. Macy, Heather Graham, Philip Seymour Hoffman, Thomas Jane, Alfred Molina, etc etc etc etc. I mean, come on! But it’s not just that there’s so many great individual actors; they all just interact so well together. Maggie (Julianne Moore) and Dirk (Mark Wahlberg) have a particularly weird, but still convincing relationship. They have a real Oedipal thing going on. I think what I love most about the actual filmmaking of Boogie Nights is the transitions. Scenes so often change without being cut; maybe we’ll follow a car driving away at the end of a scene, which passes by a character who will take us into the next scene. It’s a really cool way of totally capturing this weird, sort of closed off universe that Boogie Nights exists in. One of my friends in high school made the mistake of seeing Boogie Nights with her parents. So definitely see it, but definitely be aware of whom you’re seeing it with. I’m not sure why it took me so long to watch this movie but it’s a masterpiece. This movie has one of the best scenes I have ever come across in my movie watching experience. The scene is the one where Alfred Molina shows up. It’s beyond what I thought this film could provide. It’s pure magic. The other thing that I think makes Boogie Nights so grand is the fact that it has an all-star cast but that it’s not distracting. This movie provided so many things that I thought I would never see involving so many actors that I really really like. The movie was great and I hope that I watch it again soon. Boogie Nights is one of those films I always try to convince people to watch if they haven’t already. I love Heather Graham, Burt Reynolds, Mark Wahlberg, Philip Seymour Hoffman, they are all brilliant! I feel so bad for William H. Macy’s character, and even though I know how it ends up for him, I still will things to change. Such a great film!